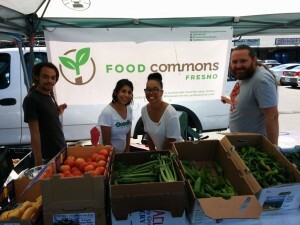 In 2012 leaders of Fresno’s business, academic and social balance communities embraced the Food Commons vision and invited the Food Commons to adopt Fresno as our first prototype site. Since that time we have been working with individuals and organizations in Fresno to design and build a “fractal” of the Food Commons system as a proof of concept and as an engine for economic development, job creation, and healthy food access in a region characterized by the paradox of great wealth and agricultural resources existing side by side with entrenched poverty, food insecurity, and diet-related chronic disease. - Introducing its first business operation, Ooooby (Out of Our Own Backyards) weekly produce box delivery. - Launching Food Commons Fresno wholesale distribution business, leveraging restaurant, institutional, and retail relationships and partnerships with Tower Urban Family Farms, TD Willey Farm and others. - Reaching annual revenues of approximately $700,000 from retail and wholesale sales to over 1,900 customers, with over $450,000 paid annually to local farmers. - Leasing its first farm, taking over operation of the 75-acre TD Willey Farm in Madera, Calif. The farm grows diversified, certified organic vegetables for Ooooby and other local retail and wholesale customers. - Converting its Belmont facility to a commissary kitchen in 2017 to serve food trucks and bicycle food cart vendors. Plans are underway to develop the facility into a small-scale test and production kitchen to create value-added food products using locally sourced ingredients. - Employed a diverse workforce, including 28 full and part-time employees in its hub, kitchen and farm operations. For more information visit the Food Commons Fresno Facebook page or the Food Commons Fresno website.